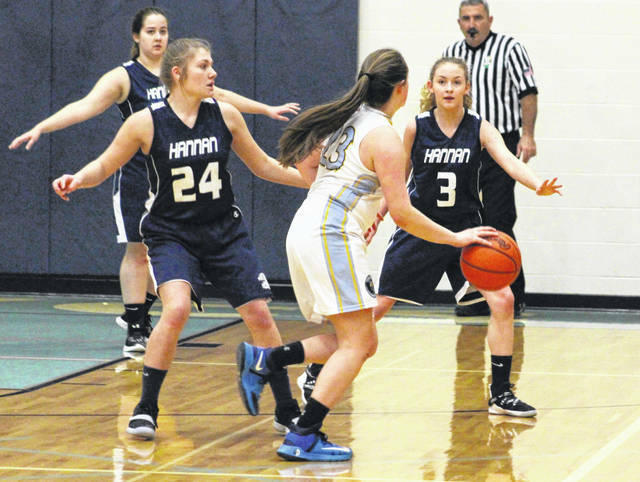 Hannan defenders Halie Johnson (24) and Madison Gill (3) apply pressure to Ohio Valley Christian’s Kristen Durst during the second half of Tuesday night’s girls basketball contest in Gallipolis, Ohio. Ohio Valley Christian freshman Chloe Payne (55) releases a shot attempt over Hannan defender Josie McCoy (2) during the second half of Tuesday night’s girls basketball contest in Gallipolis, Ohio. GALLIPOLIS, Ohio — Apparently the weather warmed up enough to go for a run after halftime. 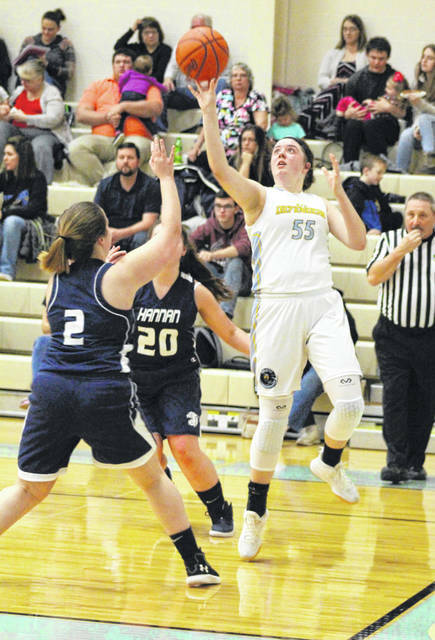 The Ohio Valley Christian girls basketball team overcame a two-point deficit at the break with a ferocious 24-6 second half surge on Tuesday night while cruising to a 36-20 victory in a non-conference matchup in Gallia County. The Lady Defenders (9-9) found themselves in early holes of 6-5 and 14-12 after each of the first two quarters of play, but the hosts held the Lady Wildcats (6-7) without a field goal in the second half while making their impressive charge. Lauren Ragan broke a 14-all tie with a free throw at the 6:42 mark of the third frame, which ended up providing the Blue and Gold with a lead that they’d never relinquish. Julie Frazier accounted for Hannan’s only point of the third quarter with a free throw at the 4:45 mark, which cut the lead down to 17-15. The Blue and White, however, were never closer as Ohio Valley Christian closed the canto with 11 consecutive points while extending their lead out to 28-15 headed into the finale. The Lady Cats ended six-plus minutes of scoring futility as Bailey Coleman sank a free throw with 6:37 left in regulation to cut the deficit down to a dozen points at 28-16, but the hosts reeled off eight straight points as an Emily Childers free throw capped the run and gave OVCS its largest lead of the game at 36-16 with 4:14 remaining. Frazier netted the guests’ first second half basket with 2:59 left in the contest, then added another basket with 50 seconds left to wrap up the final 16-point outcome. The win completed a 31-point turnaround after Hannan won the first matchup between these two programs by a 36-21 margin in Ashton back on Dec. 7, 2018. And, at least for 16 minutes, it appeared that a season sweep might be in the making — that is until the hosts turned up their defensive intensity. Conversely, it was tough night for HHS coach Kellie Thomas to accept — particularly since her troops entered Tuesday with a two-game win streak and victories in three of their last four decisions. The Lady Defenders netted 13 total field goals — including five trifectas — and also went 5-of-11 at the free throw line for 45 percent. Emily Childers paced OVCS with a game-high 17 points, 14 of which came in the second half. Chloe Payne was next with 13 points, while Leticia Araujo and Kristen Durst respectively added three and two markers. Ragan also had one point to complete the winning tally. Hannan made seven total field goals — including a single 3-pointer — and also went 5-of-9 at the charity stripe for 56 percent. Coleman led the guests with 10 points, followed by Frazier with five points and Madison Gill with four markers. Josie McCoy completed the HHS tally with one point. OVCS returns to action Monday when it welcomes North Pleasant at 6 p.m.
Hannan returns to action Saturday night when it hosts Fairview for a 6 p.m. contest.